The Gates Carbon Drive belt system is a great addition to any bike with an internal shifting system such as the Rohloff SPEEDHUB 500/14, Shimano Alfine, and Nuvinci/Envilio internal gear hubs or Pinion gearbox. Unlike the chains used in traditional drivetrains, the Carbon Drive belt provides thousands of trouble free off-road miles and tens of thousands of reliable on-road miles, all without need for extensive cleaning or lubrication. 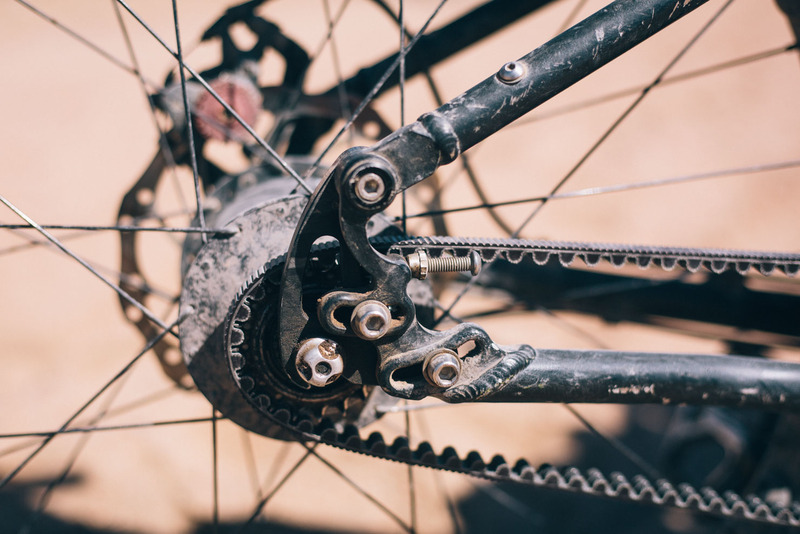 While they generally run nearly silent, belts occasionally squeak as they interact with the metal sprockets at either end of the drivetrain, which many riders find annoying. This is most likely to occur when the belt system is subject to dust or other fine particulates. At Cycle Monkey, we have had good luck using Rohloff’s biodegradable chain lube to combat this squeaking noise. Applying just a few drops of this thick, wet weather lube typically provides months of quiet riding in our dry Northern California climate, where frequent 8-9 month periods without precipitation lead to a progression from dusty to extremely dusty the further we get from the last rainfall. In our travels around the country, the Rohloff chain lube has worked equally as well in other climates and riding conditions. Other thick/wet weather chain lubes could also be effective, but we have not yet tested any of them because of the reliable results of the Rohloff lube. Gates has tested the Rohloff lube to ensure that it does not cause any deterioration of the Carbon Drive belt. You can order the Rohloff chain lube here. Gates officially recommends the use of silicone spray to address belt noise. In our experience, these sprays eliminate noise in the short term, but do not provide the same long-term performance we’ve seen with the Rohloff chain lube. Results vary based on environmental conditions, but we typically need to re-apply the silicone spray every few weeks as opposed to months of quiet riding with the Rohloff lube. It’s worth noting that use of the Rohloff chain lube does make the belt a little “dirty” compared to unlubed belts, which are completely clean to the touch. Use of silicone spray maintains the cleanliness of the belt, making it the preferred choice of the crew at Gates. Astute readers of the Carbon Drive owners manual will note that on page 3, under the heading “Care for your Carbon Drive”, bullet point #4 says “Do not lubricate.” No need to worry—this recommendation is for regular use where no squeaking is present. Gates does not require the use of any sort of lubricant on our belt drive system. We only present the option for extremely dry and dusty conditions to mitigate noise. The system is designed to function without any sort of added product on the parts for its lifespan. You could run the drive without touching it for thousands of miles, you may just get some noise in particular scenarios so in that sense, it is bomb proof, it just has its quirks. 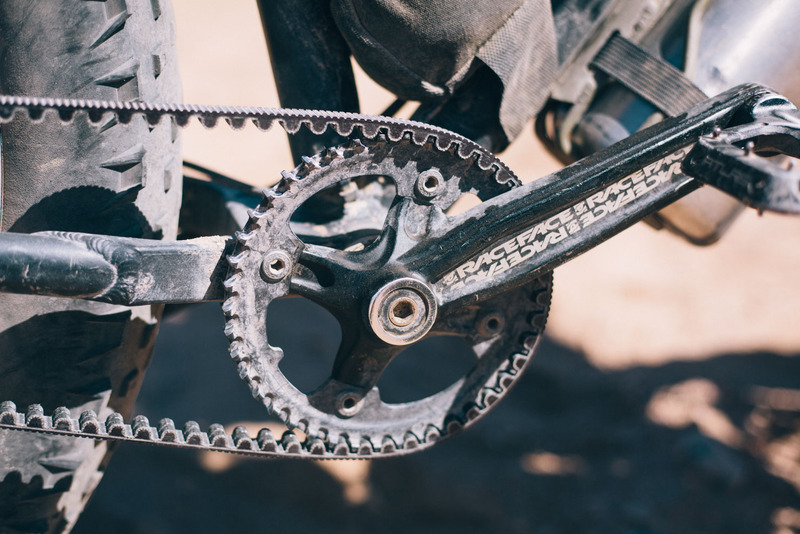 We do recommend regular cleaning of the drive in order to maximize the longevity of the belt and sprockets. This will generally last several hundred miles in those conditions or until it is washed off. If you are experiencing a squeaky belt drive when riding in dusty conditions, remember that it’s not indicative of a major problem with your drivetrain, even if the squeaking drives you crazy. And with a small amount of effort, you can set up your belt for quiet performance in any conditions. If you’re looking for the longest-lasting solution, Rohloff’s chain lube is the best option we know of. If you want to maintain the absolute cleanliness of an unlubed belt, opt for a silicon spray like that suggested by Gates. In a pinch, a blast of water from a water bottle will provide short term noise relief to help get you to the end of your ride. If you want to stay up-to-date on our latest technical tips and tricks, be sure to follow us on Instagram and give us a like on Facebook.